Talk about the nexus between the worlds of commercial real estate and fine art !! But the complex is privately owned and Long Island City real estate values have skyrocketed in recent years. On October 9, 2013, the New York City Council unanimously approved a $400mm plan to replace the existing structures with 1,000 apartments located in 2 towers; one of 47 floors and the other of 41 floors. But what about the rights of the graffiti artists? A 1990 federal statute, little known outside the fine art world, appears to have induced Federal Judge Frederic Block to slow the demolition process down to enable a closer look at the issues. The statute is known as VARA (“Visual Artists Rights Act”) and, among many other things and upon certain conditions, it affords artists the right to prevent the destruction or mutilation of their work. The thrust of the artists’ complaint is that the buildings’ demolition will destroy their artistic works in violation of VARA. By granting a temporary stay, Judge Block seems to think that the claims may have potential for merit. An evidentiary hearing has been scheduled to commence on November 6, 2013. There are many issues at play. For example, is graffiti art of a recognized stature so as to qualify for protection under VARA, that is, is a tag artist entitled to the same protection against the destruction of his work as a Damien Hirst or a Jeff Koons? Does the artwork qualify as “work for hire” which would vest sole control and custody to the building owner? Is the art “site specific” so that any attempt at relocation would destroy the work? In our view, graffiti art seems in many respects to fit the very type of work which VARA seeks to protect against destruction. However, the nature of graffiti art is transitory. The form, itself, is an underground almost guerrilla format of art which is intended to “tag” the target, but with the implied understanding that the work will likely be painted over, replaced, covered, etc. over time. In fact, the Court seems focused on one of the parties “.. causing works to be whitewashed and/or painted over.” The impermanent nature of the form should speak against using graffiti art preservation as grounds to permanently prevent the development of a real estate site. 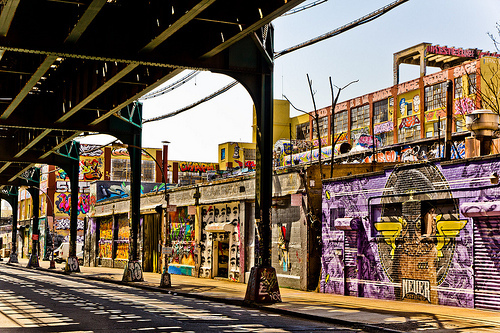 On the other hand, the argument can be made that it matters little how an individual work may impact 5pointz, because it is the effect and impact of the whole which is striking even if the singular constituent artworks change over time. However, VARA is intended to protect only the individual artist, and not an artistic community. Nonetheless, the transitory nature of an art form is not mentioned in the VARA as grounds to exclude the statute’s protections, nor has impermanence been tested in the Courts as a defense to VARA. In fact, VARA cases in the real estate realm are few and far between. This is a big case with lots of money and political influence at play. 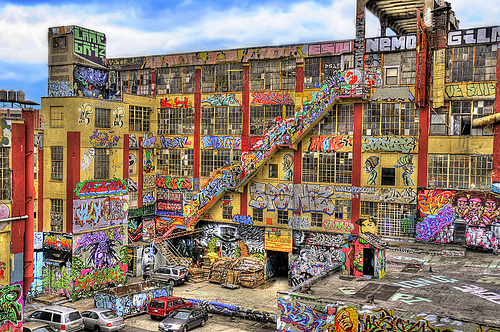 On the other hand, 5pointz has become a site of some cultural significance. The stakes are big. The few times since 1990 that these cases have come up for judicial review, the Federal Courts have seemed willing to limit the reach of VARA, sometimes for controversial reasons, and allow the property owners to develop their sites. Be forewarned, though, because this particular case is no slam dunk for the property owner. For sure, since 1990 commercial owners should be securing written VARA waivers from tag artists if they allow their buildings to be adorned with graffiti art. But property owners are generally unaware of VARA and the rights which flow to artists under the federal statute.